Thanks to the folks at Harper Audio and Avon for including me in their booksigning at RWA last week in Orlando! 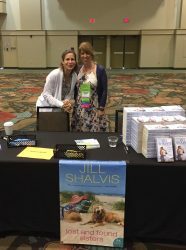 It was an honor to sit next to Jill Shalvis and help promote Lost & Found Sisters (with Susan Elizabeth Phillips on the other side!) and talk to audiobook fans and fans-to-be, all of whom were excited to receive copies of the book. It was also great to see Rebecca Zanetti again! I’ve loved recording her Dark Protectors, Sin Brothers and Blood Brothers series. 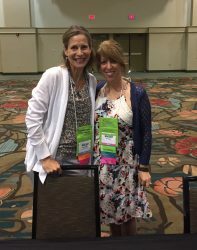 RWA was a fun-filled week and I’m already looking forward to next year’s in Denver. The group of authors who attended the audiobook panel I was on (Audiobook Strategy for Indie Authors) as well as authors I met all week seemed eager for information on publishing in audio. If you’re a romance author, blogger or fan, what kind of audiobook panels would you be interested in attending at RWA next year? The members of RomanceNarrators.com plan to be there in force and we want to propose events that you’ll love! Finally, here’s a shot of a beautiful evening at Epcot. Thanks to authors Jen Malone and Vivi Barnes who let me tag along with them.